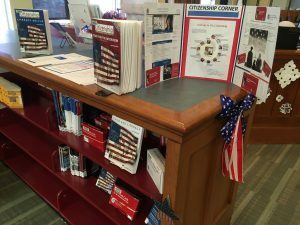 The Citizenship Corner, located in the Reference Room on the Second Floor of the library, has U.S. citizenship test preparation materials, including books, flashcards, and DVDs. These materials are all available for check out, thanks to funding from the Pollard Memorial Library Foundation And don’t forget the helpful web links that can be found below. For more information on the Citizenship Program or to make an appointment, please call Gail at 978-918-3519. Have you been a lawful permanent resident (Green Card holder) of the U.S. for at least 5 years (3 years if married to a U.S. citizen)? Are you able to read, write, and speak intermediate English? Will you be able to attend all classes during the 10-week citizenship course? If you are interested in registering for an upcoming citizenship class or for more information, please call Gail at 978-918-3519. (Please leave a message if she is unavailable.) You can also email Gail at gcpf42@yahoo.com.